I look around me and I see FULL life. I would like to think that there are things missing. I would like to store up all those handy items and dreams for my future. But the truth is that this IS my life. And at this moment, nothing needs to be added or taken from it. We shortchange ourselves all the time. We insist that we need this and that to be happy. We have convinced ourselves that our dreams and goals are missing parts of us. These are dry seasons because we aren’t at the place we think we should be. We assume ourselves to be a in a waiting period when we literally have so much in front of us. We live a 1-dimensional life, thinking that we could be so much more, have so much more, experience so much more. We live our lives with the lens of discontentment because we have convinced ourselves that this isn’t life. This isn’t enough. This isn’t what we wanted to be. These aren’t the experiences we thought up when we were younger. But if you rip off all your expectations and all the things you think are missing from you life, you free up your heart & head to see, feel, know, and experience everything that’s around you. When you remove the lens of discontentment and unrest, your life becomes 3-dimensional. You aren’t living in what you could have, what you might be, what you thought up….you are living in real life. I’m not saying life is always easy or flowery or that there is no such thing as unmet dreams stored in our hearts, but we can’t let them control us. We can’t let these things tie us down or make us live a 50% life. We live in a dark, dark shadow when we cut our lives in half, convincing ourselves it’s just not a good life after all. These things might sound ludicrous to you, because for so long we’ve just decided that discontentment is OK and we are comfortable with comparison. Even writing this out, I’m trying to be polite, but really, WE JUST NEED TO STOP living our lives like they aren’t 100% there. Everything around you & me is our life. It is 100% our life. It is 3-dimensional. But we so often decide to live only part of it. We look around, out, up, and down at everything that isn’t. The missing dreams and aspirations become so much a part of us that we let them hollow out our hearts. They become the definition of our life’s quality. We sit down and give up living fully. Because this is only half of what our life should be, would be, will be…. this is our 100% life, and we need to be 100% people. We need to live the day in front of us, thankful for what we have, working toward our goals, realizing the dreams that have been completed, and stop dwelling on the in-completes. Today doesn’t have to be another day in a dry, brittle season. Sometimes, discouragement is caused simply because we are discontent. So are you discontent? Are you attributing this “dry” season to all the unfulfilled dreams and unmet expectations? Is that how you are judging the quality of your days? Because if it is,then you’re responsible for living only 50% of your life. You actually have life 100%. And you have the ability to be a 100% person, enjoying, embracing, and taking in this season. You have reasons for joy. You aren’t missing huge chunks of life, because this is your life. 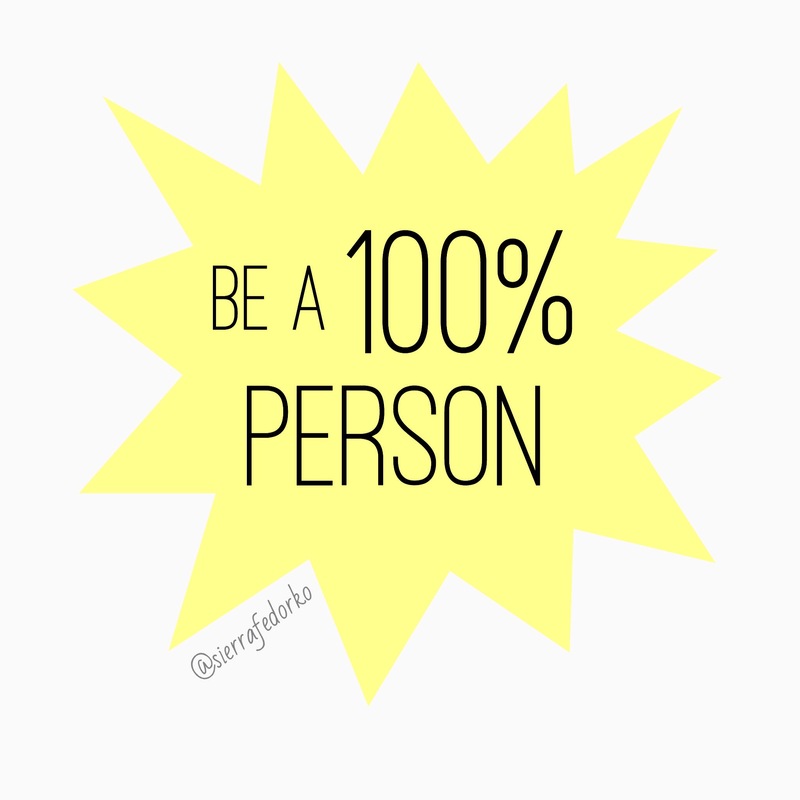 Are you going to be a 100% person in your 100% life? Or are you going to be a 50% person in your full, vibrant, God-given 100% LIFE? I love this so much, Sierra!! I will definitely be looking at each day differently.